At the end of 2010 we moved into bigger premises. This had become necessary due to our rapidly growing reputation and client base, as well as our need for more ramp and storage space. We also have a dedicated reception area, where our customers can sit in comfort and enjoy a nice cup of tea or coffee while our team look after their requirements. Whether booking in, collecting, or just needing advice, our friendly and knowledgeable staff are always ready and willing to help. Our current site is self contained with a secure perimeter fence. We also have CCTV and PIR lighting, so you can always be assured of your vehicles safety. 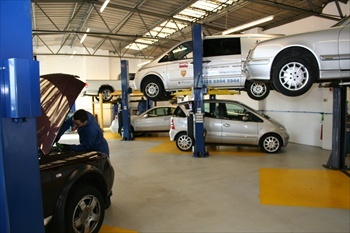 Our workshop has been fitted out to the highest specification and we are very proud of the space we now occupy. We have spared no expense in putting together a working arena that rivals any main dealer. We are specialists in all aspects of automatic gearboxes. Our team of expert technicians are experienced in all automatic gearboxes and their respective electronics, whether they be car or commercial. 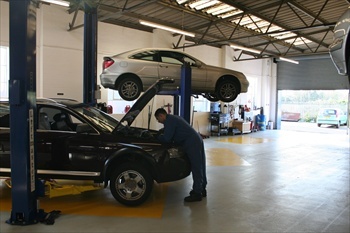 We currently have Eight ramps in the workshop area which covers over 4,000 sq ft. We also have a dedicated diagnostic area which allows us to diagnose faults as well as reprogramming and resetting the ECU. We are a dedicated automatic gearbox team who provide a fast, reliable and top quality service on all makes and models of automatic gearboxes. We are one of the few automatic companies who still deal solely with automatic gearboxes. We supply a close personal attention to all our work, which is backed up by our superior warranty. The owners of JT Automatics have been in the automatic gearbox trade all their working lives and are second generation automatic gearbox specialists. We have worked very hard to earn our reputation for the reliability of our work and our high level of customer service. Our fitting service is second to none, with turn around times from same day to 2-3 days, depending on a unit being available from stock. We also supply and rebuild gearboxes and torque converters over the counter. All materials used by our company are sourced from the best manufacturers of gearbox parts, whether it be OEM or aftermarket manufacturers such as Transtec and Precision, who are among the worlds leaders in automatic gearbox components.